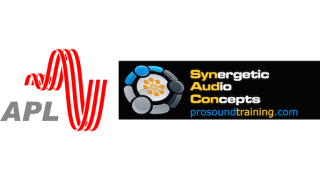 Acoustic Power Lab (APL) has joined SynAudCon’s sponsorship program. The APL development team focuses on getting the truest sound from the loudspeaker by use of detailed correction/equalization based on measurements that emulate human perception of sound in magnitude as well as the time domain. The goal is to make the loudspeakers as neutral as possible by reducing the coloration caused by time domain smearing and frequency domain resonances, allowing the audio professional to produce a better end result. APL offers the audio professional a range of products to help achieve that. The products include the Measurement and Equalizer Synthesis Software Workshop, TDA EQ, TDA Measurement Software, FIR Filter Unit, FIR Filter VST plug-in, and the Custom Measurement and EQ Synthesis for headphones. "We are very excited to have APL join our growing list of sponsors,” said Pat Brown, president of SynAudCon. “APL has made a commitment to supporting pro audio education efforts across the industry. We appreciate their products and their backing. We look forward to working with them." “We are proud to support Pat’s and Brenda’s passion to give to professionals of audio engineering ` and high-quality sound enthusiasts the knowledge to make their work more efficient, accurate, and pleasant to achieve high artistic results,” said Raimonds Skuruls, chairman, APL. “We are happy to support those intentions with new tools and solutions.